Created with the vision to give the world's best snowkiters on skis and snowboards a platform to showcase their talent, the IKA SnowKite World Cup 2019 kicked off in Italy (Roccaraso) with the special discipline “Formula GPS”, followed by the biggest Snowkiting event this season in South Tyrol at the International Snowkite Open at Lake Resia. Just a weekend later the first IKA Snowkite World Cup in Russia took place in Tolyatti. Erciyes (Turkey) welcomed everyone in the beginning of March to race at the foot of the 4000m high volcano, culmunating in crowning the new IKA SnowKite World Champions last weekend at Lake Silvaplana in Switzerland. 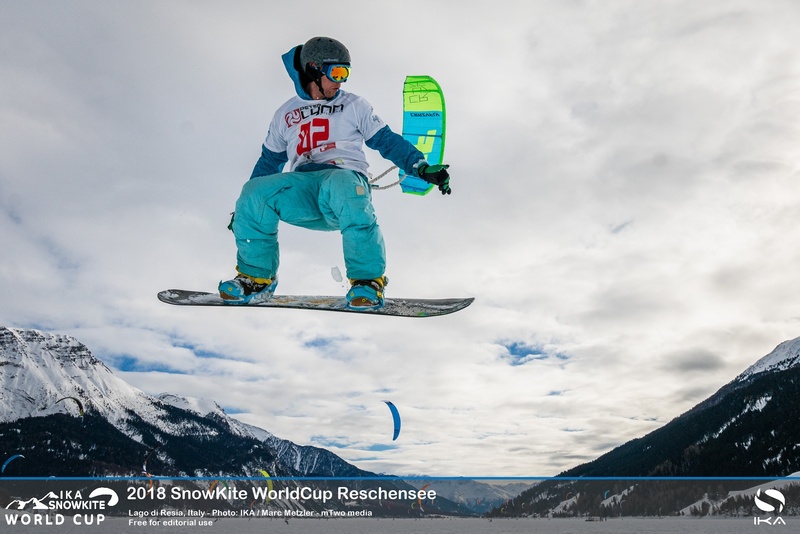 From 15th to 17th March 2019, the Snowkite elite will meet for the Grand Finale of the "IKA Snowkite World Cup", and for the last event of the season: the "Swiss Snowkite Tour" in beautiful Switzerland - more precisely in Silvaplana. After a successful winter season, both series of competitions will enter the decisive final weekend. 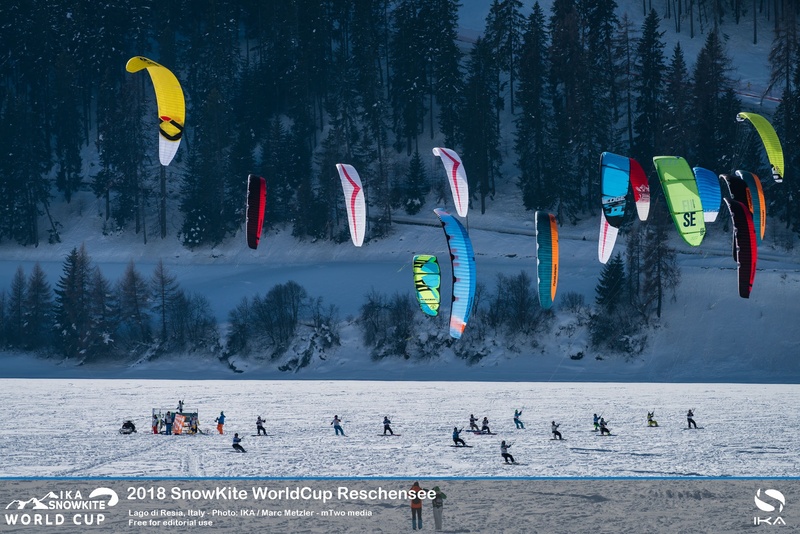 In the past few weeks, the World Cup has stopped in Italy (Roccaraso), South Tyrol (Reschensee), Russia (Tolyatti) and Turkey (Erciyes) and in the incoming week, numerous snow kiters and avid fans will be expected in Switzerland in anticipation for the Grand Finale. The "Swiss Snowkite Tour" has been an established and popular event series amongst athletes for many years. 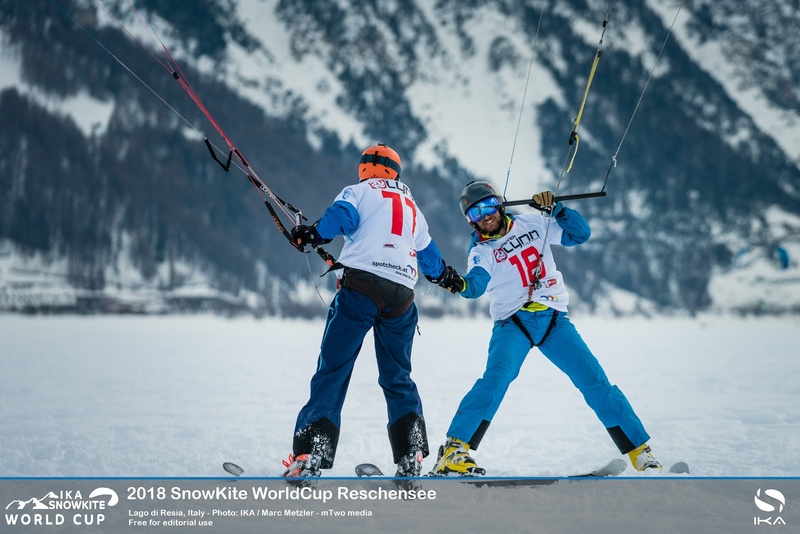 With great love and dedication, the team has managed to grow the tour, and in 2019 they welcome the IKA Snowkite World Cup for the very first time. Expect some serious competition when the best snow kiters fight for the coveted winning title. At the Silvaplana (alternative opportunity Bernina) World Cup level disciplines are as follows: Racing Ski, Racing Snowboard, Long Distance Ski and Long Distance Snowboard. 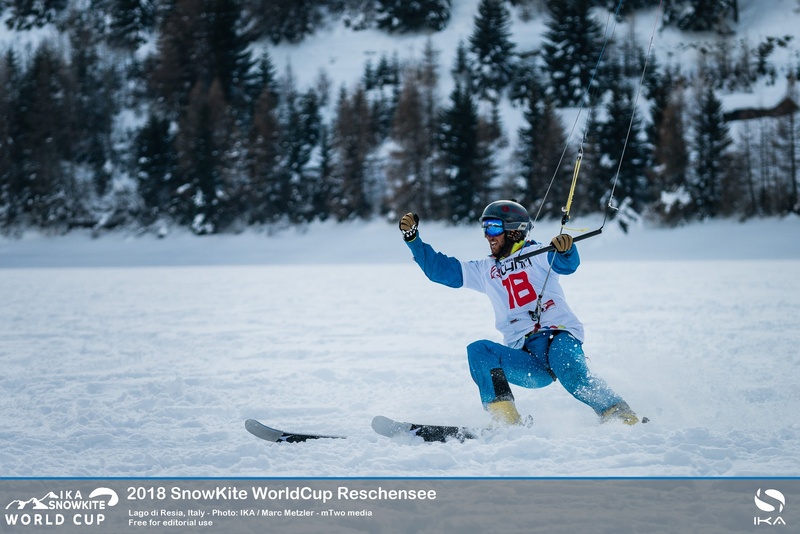 rom 15 - 17 February 2019 Lake Resia was the host for more than 90 Snowkiters from all over Europe at this years second IKA Snowkite Worldcup stop with Florian Gruber (GER) being the dominating force in both ski course racing and long distance disciplines. The first day was all about the long distance race, where more than 70 Snowkiters fought to finish the course around the lake as fast as possible. After seven laps and approximately 50 km in 90 minutes Florian Gruber (GER) finished just before Felix Kersten (GER) and Pavel Kolabin (RUS) in the ski division. In the snowboard division Reinhold Gehrer (SUI) was the clear winner. Behind him, Denis Garashchenko (RUS) had a battle with Bruce Kessler (CH). Garashchenko was able to prevail and crossed the finish line in second place. Kessler followed him and took the third place. The best lady of the snowboard division was Valeria Garashchenko (RUS). In second place is Chanti van Boxtel (NED). Among the female skiers, Mariska Wildenberg (NED) took the first place. The 16 years old Maya Kowa (GER) achieved the second place ahead of Jana Schader (GER). Saturday and sunday was all about Freestyle and Course Racing. The second day brought bright sunshine and a stable northerly breeze of 8-14 knots. In the ski division Gruber was given the trophy for the first place a second time during the event due to his kite skills. Nikita Kodanev (RUS) tried hard to fight against his countryman Florian Gruber but could not beat his outstanding performance. Though with one podium spot it was truly a successful weekend for Kodanev. The third place goes to Pavel Kolabin. In the snowboard division Miroslav Schuetz (CZE) led the riders across the ice and was the first to cross the finish line. He was followed by Bruce Kessler (SUI) and Artem Renev (RUS). The best riders in the world will compete in the mountains of the Alto Sangro ski area at SnowKite WorldCup from 14th to 18th February. 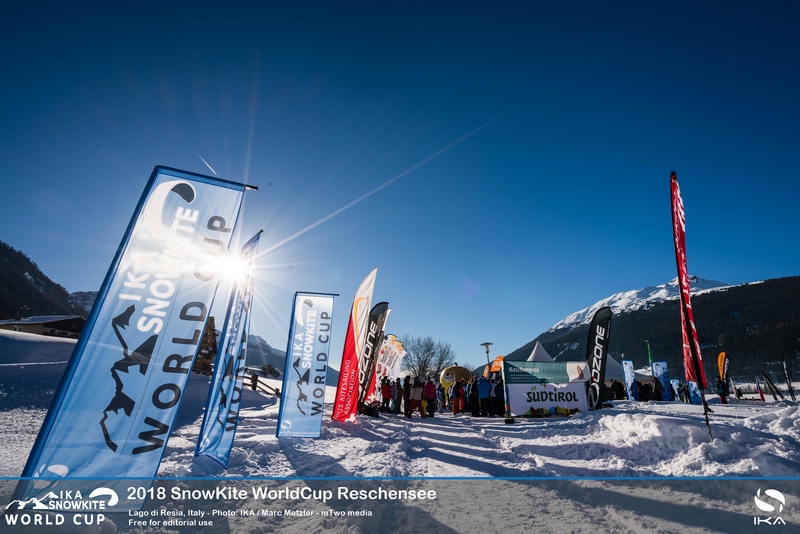 The event is a part of a world tour promoted by IKA (International Kiteboarding Association), member of World Sailing, and in collaboration with FIS (International Ski Federation) on individual snowkite events. The disciplines will be CrossCountry / Long Distance and especially the GPS Formula. The organizers wish to give a special thanks to the sponsors who support the event every year. In addition to the institutional partners of the Abruzzo Region, Province of L'Aquila, the Municipality of Roccaraso and Rivisondoli. We would like to thank the Main sponsors of the event. First of all, the Municipality of Roccaraso, which has supported the event for over 5 years, AmicoBlu, Italian leader in the rental of vans - which has made available to the organization a commercial vehicle for logistical support. The van, in fact, will be transformed into a moving that will allow the organizers to follow the athletes in the various race fields the Alto Sangro Skipass Consortium which offers athletes the opportunity to access the competition fields and provide logistic and safety services for the competition, Banca del Credito Cooperativo di Romaand the IKA, Intenational Kiteboarding Association, for the methodological contribution and Race management.The technical partners, Ozone kites, Flysurfer kiteboarding, HQ Powerkites, Mancini Sport, la Clinica dello Sci, web portal Kiteordie and Mountain Lab deserve special mention. 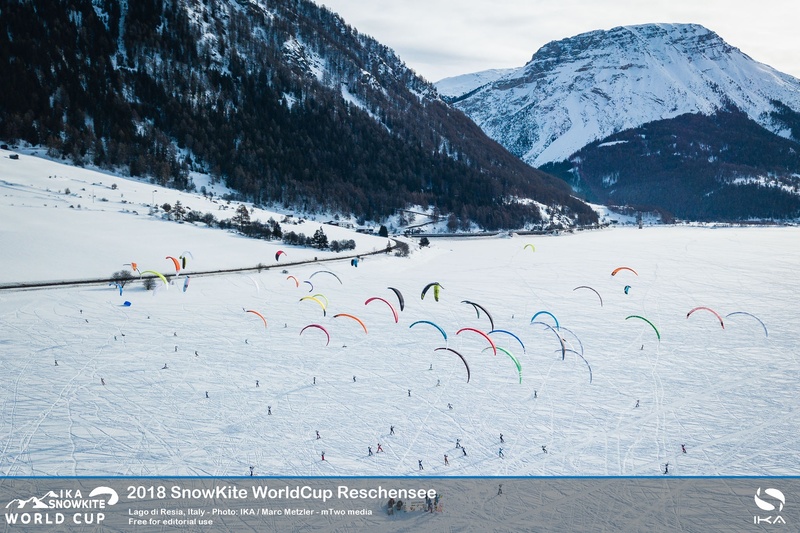 From 26 – 28 January 2018 Lake Reschen played host for more than 80 Snowkiters from all over Europe at this years first IKA SnowKite WorldCup stop with Florian Gruber (GER) being the dominating force in both Course Racing and Long Distance disiplines. The first day was all about the Long Distance Race, where 81 Snowkiters fought to finish the course around the lake as fast as possible. After four laps and approximately 60 km in 1hrs and 39 minutes Florian Gruber (GER) finished just before Felix Kersten (GER) and Bruce Kessler (SUI) in the ski division. In the snowboarding division Ronny Bollhalder (SUI) was leading the first two rounds and had the victory almost secured until cramps in his legs stopped him from keeping up his lead. Bernd Spiering (GER) and Aldo Storelli (ITA) took advantage and left Ronny in third place. Saturday and sunday was all about Freestyle and Course Racing. Unfortunately the wind didn’t show up on Saturday so that the spectators and competitors enjoyed the beautiful weather and great athmosphere in the event village. The windless day was no disappointment for the many spectators though who came out to the event village to enjoy the hospitality and get a taste of the local food and drink specialities on offer. Old and young enjoyed the sunshine, after it had snowed for almost one full week in the leadup to the event. The final day brought bright sunshine and a stable northerly breeze of 10 knots, and racing finally got underway at 10:30. 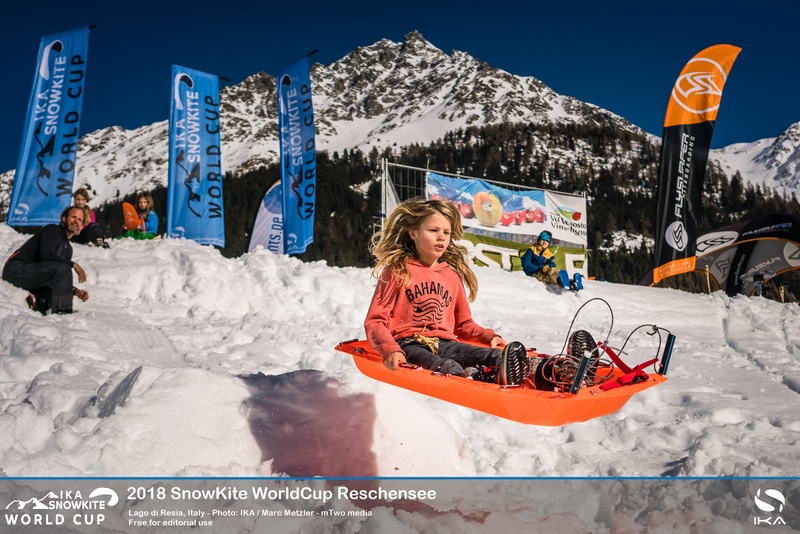 After 6 successful races and a few prostest hearings the organizer were able to crown the winners of the first event of the IKA Snowkite Worldcup 2018. Felix Kersten tried hard to fight against his countryman Florian Gruber, but couldn’t beat his outstanding performance. With another second podium spot it was truly a successful weekend for Felix. The third place goes to Russian Pro-Rider Andrei Balyakin. With her first time on ski while kiting, Jana Schader (GER) left Anna Maria Gadzinowska (ITA) and Lisa Pozzi (SUI) behind and scored another spot on the podium. In the afternoon the Freestylers were able to show what kind of tricks they got in their pockets. In the middle of lake they hit the kickers and sliders and impressed the crowds with spectacular rotations and jumps. Andrea Luca Amman (SUI) was able to take the victory before local Rider Fabian Oberhofer (ITA) and Heinar Brandstötter (AUT). Jana Schader (GER) went straight after the races into the Freestyle-Competition and won against Aina Renolen (NOR) and Carola de Groot (NED). The tour now continues to the second Italian stop in Roccaraso, where the Formula GPS discipline will debute and reward the best Ski and Snowkite Freeriders for best use of the terrain. As second discipline, Cross Country Racing is scheduled, long distance races similar to the one on Lake Reschen but including ascends and descends as given by the large skiing area in central Italy.